Finishing Is Done Using Easy Sand Quickset And Ready Mix Joint Compound Easy sand allows quick setting allowing us to apply three or four finish coats in one trip. Our first coat of is taping followed by float bed coat then a skim coat. Before sanding the joint compound will be allowed to dry for at least 24 hours. Drywall Specialist patches holes and cracks in drywall. We also repair Nail pops, loose drywall tape and metal corner bead, wet water damaged walls and ceilings. Drywall Is Our Only And Primary Business. We treat each drywall repair or installation project, as if it were our own home. We have over forty seven years experience and work very hard to make sure that your home gets the professional attention that you expect and deserve. You should not have to settle for anything less than the highest quality drywall work. And you wont have to, when choosing Drywall Specialist. When We Arrive At Your Home You Can Expect Professional Service From Start To Finish! affordable prices and a free estimate no matter how large or small the project. Our drywall tecnicians are skilled, trained experts and will do everything possible to make sure our clients and competely satisfied. References by local people in your are are available upon request. Drywall installation, finishing and repair quotes are always free. In Addition We Offer Popcorn Texture Removal Service - We scrape and eliminating any unwanted texture and finish ceilings smooth and texture free. We have provided Pittsboro Drywall Repair services including Chatham County for over 27 years and look forward to adding you to our list of happy clients. Please call or contact Drywall Specialist with any questions. We have a FIVE-star rating on Google and would be pleased to add you to our list of many satisfied customers! Drywall Specialist Copyright 2019 All Rights Reserved 919-742-2030 Pittsboro's Leading Drywall Repair Texture Removal Service. 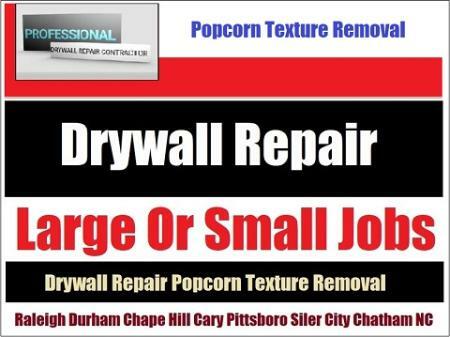 Don't Settle For Less Than Pittsboro's Best Drywall Repair Service. Call Drywall Specialist for fast, professional work by a skilled, trained, experienced expert.